Groups are boxes that help you organize your graph. To create a group, select an area on the graph while holding the Ctrl key, or Cmd on Mac. You can give each group a title that will be legible even when zoomed out. You can select all items in a group by double-clicking its header. When using the Unity control scheme, you can move the group without moving its contents by holding the Alt key and dragging its header. 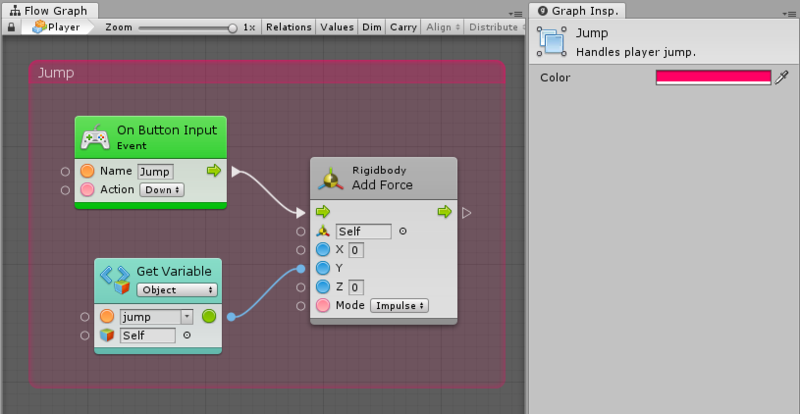 You can use the graph inspector to give a comment and a custom color to your group. The comment is only visible in the inspector.